My friends, below is an editorial by a man (Jerry Thompson) who has quite a publishing history in the Willamette Valley, is an honorable man and someone who is my friend. I disagree with many of his conclusions, but recently I changed our editorial policy to allow “all” opinions to be published so long as they offer examples or proof to back up their assertions. Since then you have read editorials on the opposite ends of the spectrum regarding the future of the coaching staff, and the amount of comments have gone through the roof. We all feel strongly about the future of the Oregon program. I have been somewhat amazed to hear reporters who follow the Ducks, and even fans express how much better Oregon played against Cal, especially in the second half. 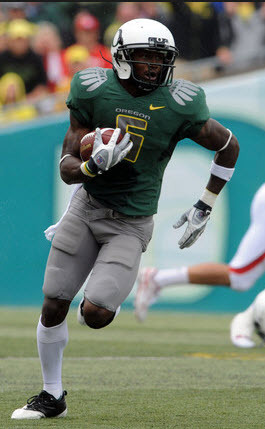 It’s as if we should be celebrating how much Oregon “improved” during the bye week and in the game. As for me, I saw the same coaching mistakes and same outcome. Nothing seems to have changed … even possibly digressed. Granted, Justin Herbert looks like the QB of the future, regardless of who the head coach is. Other than his stellar performance, this was again a game that Oregon could have and SHOULD have won, if not for a continuation of bad coaching decisions. The Ducks should be 5-2 at the least right now instead of 2-5. Nebraska: The 2-point insanity, poor play-calling and time management at the end of the first half with a 20-7 lead that should have been 21-7 or 22-7, and the misuse of Olympian Devon Allen all added up to a painful loss, negating the great effort by the players themselves. On the field in Lincoln I kept waiting for Prukop to throw the ball long to Allen. We have a speedy, long distance threat and not one time did we attempt to get the ball to him! That’s on coach Mark Helfrich as well as the totally crazy idea of having Allen as a gunner on the punt team. That means our uniquely gifted athlete has to fight off a blocker and then possibly try to make a tackle on a punt returner? How does this insane use of Allen even enter a coach’s mind? Now he is out for the season. For the record, this is not Monday morning quarterbacking, as I have asked coach Helfrich about the use of his top players on special teams where we have seen Allen, Thomas Tyner, De’Anthony Thomas, Walter Thurmond etc. go down with injuries while we could have been using other talented players who are not starters. Colorado Repeat: Are memories so short that we can’t remember what happened against Colorado … a team that arguably is better than Cal? Colorado led 26-17 at halftime and 33-17 after the first series of the second half. Sound familiar? (Cal led Oregon 34-14 after the first series of the second half.) In the 3rd quarter of the Colorado game, Oregon fought back scoring 21 unanswered points and takes the lead, 38-33 to end the 3rd quarter. The Oregon defense held the Buffaloes to 15 points in the second half after giving up 26 in the first half. At Cal – guess what happens? Oregon fought back scoring the same 21 points to take a 35-34 lead and the defense held Cal to just 11 points in the second half of regulation. Then what happened? Colorado regained the lead on a TD and 2-point conversion to make it 41-38, Buffaloes. 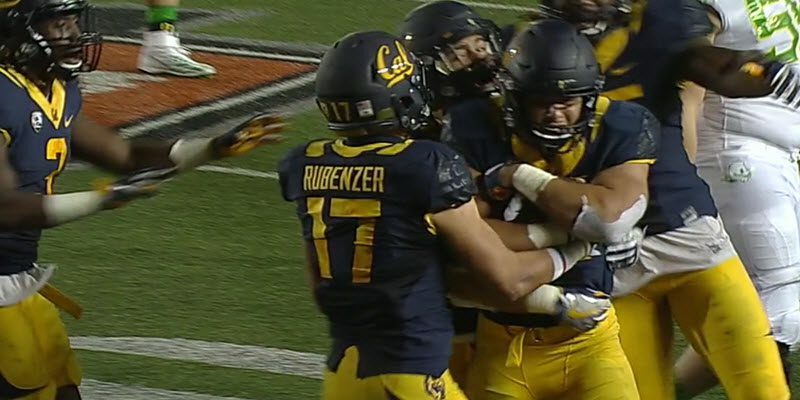 At Cal, the Bears regained the lead with a TD and 2-point conversion to make it 42-35. 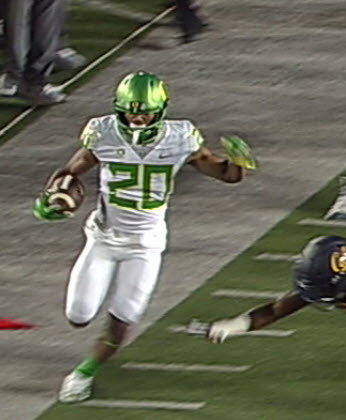 The only difference in the Cal game is that Oregon came back to tie the game and send it into overtime. Tony Brooks-James had a good running game at Cal. In the Colorado game the Ducks had the Buffaloes on the ropes trailing, 41-38, but having a first and goal with a little less than one minute to play. A tie or win should have been the outcome of Oregon’s last possession. Instead, a somewhat risky pass was called when running the ball was definitely a more prudent decision, especially having 2 time outs. Ball intercepted, game over. At Cal in the 2nd OT, needing a field goal to tie and TD to win, again the logic screams for Tony Brooks-James or Taj Griffin to get the ball against a tired Bear defense. Instead, a very limited Royce Freeman is in the game. Why?!! And of course, a somewhat risky pass play is called and the game ends with an interception. I enjoyed seeing Herbert’s talent on display, but until the coaches manage their personnel and end-of-game strategy better, I don’t see much room for optimism. Case in point on use of talent? Against one of the worst defenses (Cal), Darren Carrington has one reception in the entire game! I’m not an expert by any means, but something is definitely wrong in Duckville.